I know all of you lady-Moms out there have serious Jungle Fever going on in your house. You didn't give birth to a sweet little baby human—many have told me that they have given birth to a crocodile, a sloth, a parrot, a clingy koala, a monkey, or a tiger. Well mine is a monkey most days and a tiger others; often, he's a little of both (and on those days I can't wait for The Man in the Yellow Hat to come home and give me some much needed R&R). Since my house is a jungle, a baby jungle nursery fit perfectly. 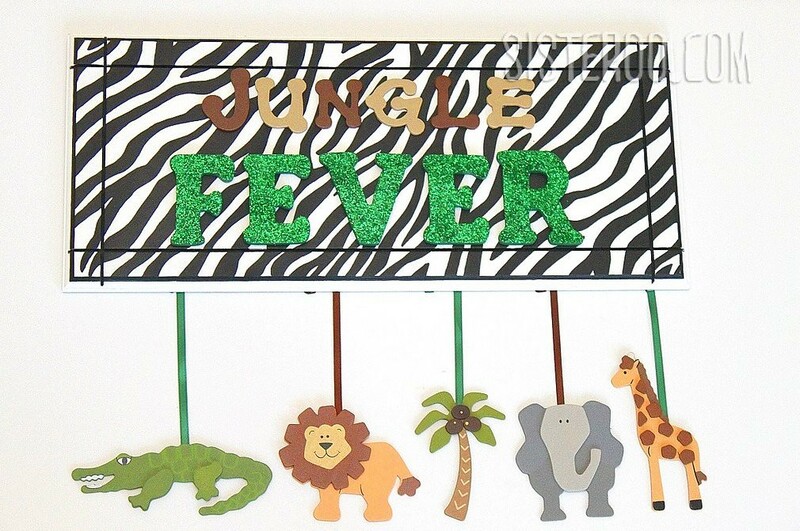 I created this Jungle Fever plaque as the finishing touch on my nursery. If you are way cooler than me, you'll have an old-school projector handy so you can print your image as a transparency and trace it OR if you have a movie projector in your home that is hooked up to a computer/server, you can select your file and view it on the projector. I am not so cool at the moment to do either method. 1.If you are doing a paint-and-trace pattern, start by painting the whole plaque the lightest/most-used color. I painted my plaque white. 2.Print off a blown-up image of your pattern (zebra stripes). You may need to print several times until you finally get the size you want. 3.Cut out your pattern and trace with a pencil (this was quite tedious because I cut out stripes individually to trace their shape, but I reused stripes on different sides of the board and changed their angles). 4.For the zebra, I traced the black stripes with a permanent marker, and then painted the black stripes. 5.Separately, I painted the “Jungle Fever” letters green and used a clear craft glue to apply glitter all over the letters. 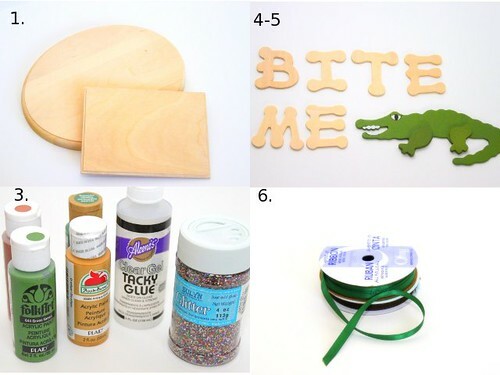 6.Super glue or glue gun the letters to the plaque after they are dry. 7.Finally, I measured and cut my ribbon, glued it to the board, and glued the ends of the ribbon to my animals. Voila! 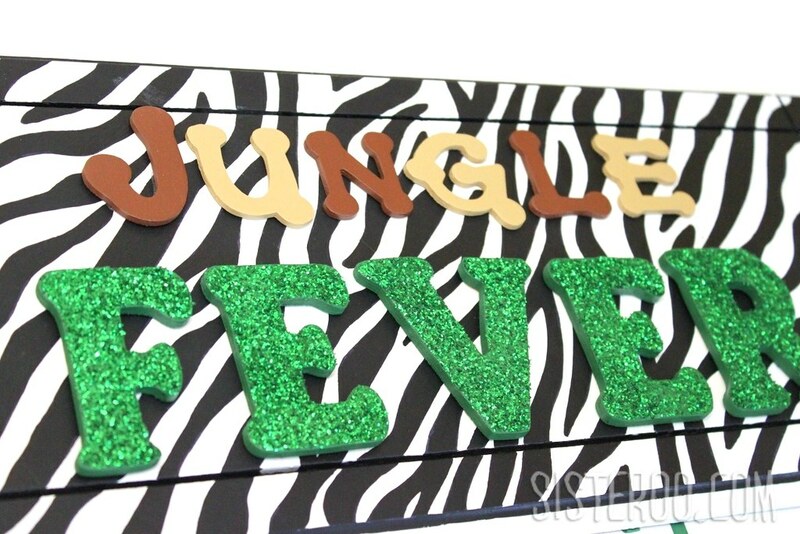 Jungle Fever plaque, one of a kind (that is, unless you decide to make one too—if you do, I'd love to hear about it). 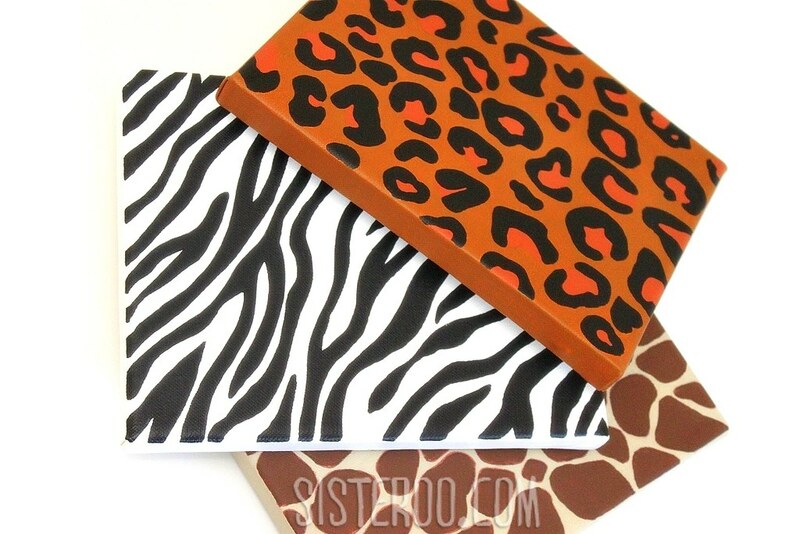 I also painted zebra, giraffe and cheetah patterns on white canvas to hang on the walls.